Many people feel more at ease when spiders remain outdoors in the garden, but as the seasons change from summer to fall here in the Winston-Salem area, those creepy crawlers start moving indoors. 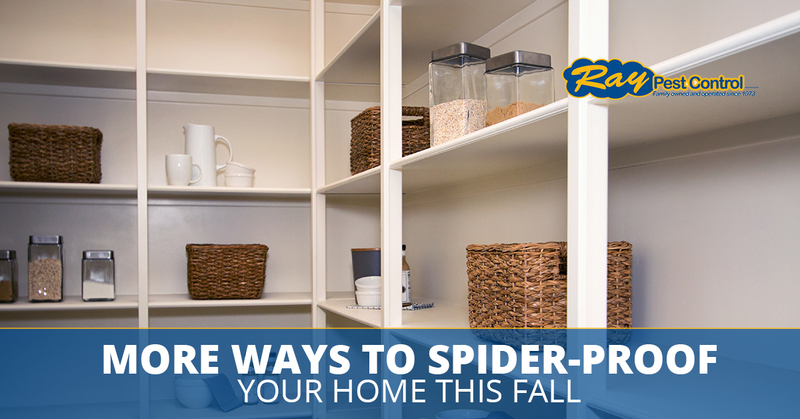 Spiders have a way of inducing fear among humans unlike anything else, so knowing how to spider-proof your home for fall can give you peace of mind. Let’s pick up where we left off last time and continue looking at more excellent ways to prevent spiders from making your home their home this fall. In our last blog, we recommended using essential oils to deter spiders from entering your home. Some folks may not enjoy the intense scents which essential oils can provide, so another great pest control method for managing spiders in the home is using vinegar. White vinegar contains acetic acid, which gives off a sour odor that spiders are very sensitive to. Simply mix one part water, one part vinegar in a spray bottle and, voila! You’ve got powerful, organic pest control in a bottle to spray around the home in the spaces where spiders dwell. Spiders like messes, especially dusty areas. Cleaning up messes and keeping the house tidy can make your home less appealing to creepy crawlies. Vacuum out vents, air ducts, crawl spaces, and behind and underneath home appliances and furniture. Dust off bookshelves and electronic stands to remove dust and cobwebs. Staying clean and organized reduces clutter, which reduces the chance for a spider to turn a mess into a home. Spiders, and most other insects, are highly sensitive to fresh mint and lavender. Keeping a small pot of these herbs in places throughout your home will help deter spiders from hanging around. If the smell of mint and lavender is too strong for your senses, try using mint tea bags instead. Along with vinegar, spiders hate citrus. Keep a bowl of fresh oranges, grapefruits, and lemons on your kitchen counter or dining room table to keep the spiders away. Use leftover citrus peels to rub around windowsills and doorways to block spiders from entering the home. By a bag of cedar chips from the local hardware store and sprinkle the chips around the exterior of your home. Try pouring a few chips into small bowls that you can place around the home to fend off spiders. This is also a pleasant way to bring the scents of fall into your home, while also using it to ward off unwelcome spiders. Fall should be scary because it’s the season of Halloween, not because your home becomes a haven for spiders during the cooler months. Following the steps listed above can help you keep spiders out of the home this fall, but if you find that you have more spiders around than you’d like to try and tackle on your own, call Ray Pest Control, Winston-Salem’s Top Rated Local® pest control experts. We’ll eliminate the spider problem from your home safely and efficiently. Contact us today to get a free pest control service quote, or if you’d like to get started on a quarterly or monthly pest control service program to protect your home from spiders.